Migration is one of the main issues of the counter mobilisation with a special 'Migration' action day on Monday the 4th of June. This article does only give an overview of the (planned) activities. For more details and up-to date information please refer to the links given in the article. Additionally should be mentioned, that this caravan/NoLager-tour will "unite" with the western part of Euromarch on 28th of May in Oldenburg. These marches against precariousness will take place between 26th of May and 2nd of June, and they move from 3 directions to Rostock in order to join the big demonstration too. Find more informations and the call also in english, french, russian at :: euromarsch2007.labournet.de. 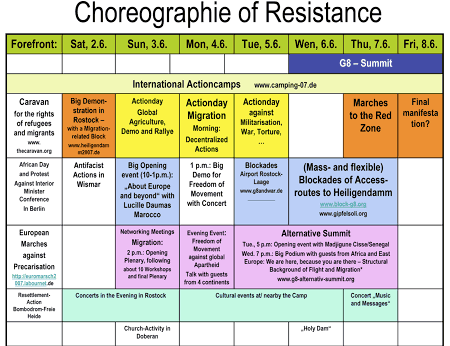 The above choreography, offers a structured overview about the whole action-week in June. The actionweek will start with a hopefully huge demonstration on 2nd of June in Rostock. You will find the call for this demonstration :: here, and it includes also some of our main migration-related demands. At 3rd of June a demonstration and a rally will happen about "global agriculture", moreover - as on the evening before - a concert and more cultural events are under preparation. Beside this the 3rd of June (sunday) should be used for networking-meetings and further discussion-events (find more below at item 3). Mass-blockades as well as flexible, decentralized blockades can be expected in the early morning of 6th of June around Heiligendamm (the place of the summit). And on 7th of June the blockades will be combined with demonstrations, which should lead to the fences of the red zone. So far a rough overview and you can find more detailled informations mainly on these two websites: :: www.heiligendamm2007.de and :: gipfelsoli.org. For 4th of June, day of migration, we plan decentralized activities in the morning, first of all a siege or blockade of the local foreign office in Rostock (where just in moment - as an example- a lot of deportations toter mobilisation with a special 'Migration' action day on Monday the 4th of June. This article does only give an overview of the (planned) activities. Togo are organized). Secondly a remembrance-action will take place in Lichtenhagen, a quarter of Rostock, where 15 years ago one of the most significant racist pogrom took place. And simultaneously at the main public place in the inner city of Rostock we want to be present with exhibitions, information-stands, street-theater and installations (of border-fences and walls for example). The call for the 4th of June can be found :: here.